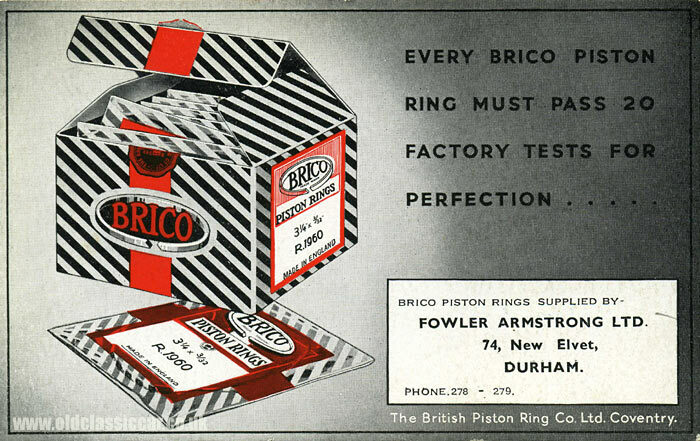 A garage blotter advertising Brico Piston Rings. Homepage. This page: A rare blotter featuring Brico rings, a product of the British Piston Ring Co. Ltd.
Throw-away items like this Brico Piston Rings blotter, usually referred to as ephemera, can be some of the trickiest paper items to find. They were designed to be used just a few times before being consigned to the bin, meaning that unused surviving pieces are now quite scarce, despite being printed in their thousands. Although now rare, they can usually still be found for reasonable prices, with only the most unusual items being worth more than a few £ a time. A number of motoring-related items like this now feature in the motoring collectables pages on oldclassiccar. Brico say about their product: "Every Brico piston ring must pass 20 factory tests for perfection .....". Brico was the brand name used by the British Piston Ring Company Limited, of Coventry. This particular blotter was issued by a supplier based in Durham, called Fowler Armstrong Limited, probably in the late 1940s or 1950s. Brico was once a well-known brand in the automotive industry, but is now I believe part of the global Federal Mogul organisation. Another well-known brand of piston ring in those days was of course Hepolite, a leaflet from this firm can be found here.